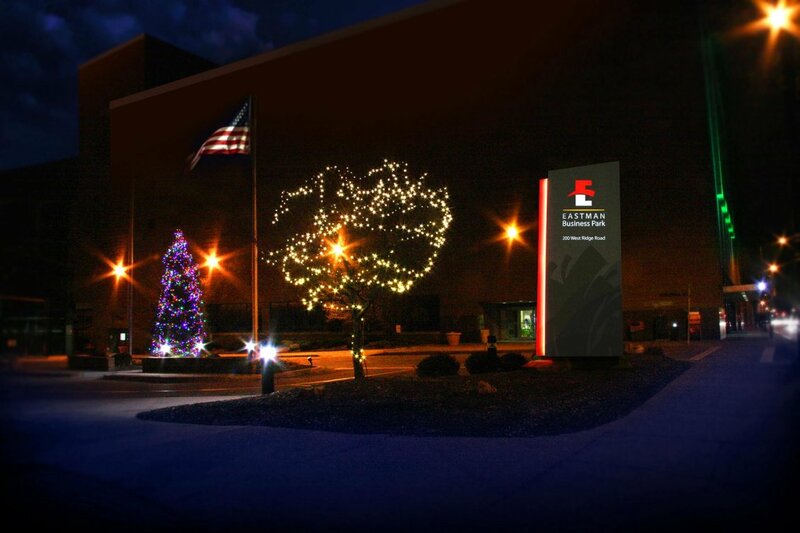 At thriving Eastman Business Park, the lights are always on! Commuters are experiencing some holiday cheer as they pass by the long red brick wall on West Ridge Road in Rochester, NY – familiar to residents as the “Theatre on the Ridge" at Eastman Business Park. The walkers and motorists frequenting this continuous 1,000 foot long stretch known locally as Building 28, are being treated to a refreshing array of constantly changing LED lights. “We're serving notice to the community that EBP is open for business, and looking for more," said Tim Palmer, who is heading up the Park's marketing effort. “Building 28 is the perfect location to call attention to that fact, because so many activities take place there every day throughout the year." 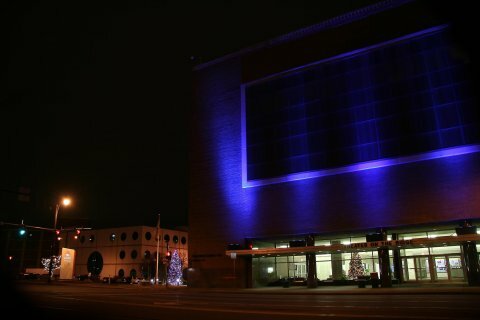 For starters, Palmer named the various events that take place at the Kodak Center for Performing Arts operated by RAPA – the Rochester Association for the Performing Arts – and at the buulding's sports arena, where a professional basketball team, the Rochester Razorsharks practices regularly. He also mentioned the newly redecorated first floor ballroom where the campus' 60 tenant companies or the community at large can book meetings and events. Palmer said these and other recent happenings are part of a comprehensive long-term master plan to transform the Park into a destination, something much more than the multi-purpose research and manufacturing facility it has become. Dolores Kruchten, Vice President of the Park, came up with the idea for the lighting, and David J. Beinetti, AIA, President and Principal of Rochester-based SWBR Architects, designed the display. Beinetti said he borrowed from the popular advertising slogan, “we'll leave the light on for you" when creating the spectacle. As the “front door" to this 1,200 acre facility, Beinetti said the building was a natural candidate for the lighting. He said the building's vertical portico provided the perfect setting to display the color and vibrancy of 10 LED lighting units mounted in five waterproof boxes. But that's just the beginning of the vision for the Park: Beinetti said he hopes that a permanent LED system will be designed in the future “to welcome visitors while improving the overall experience at this important community resource."